Today I returned from a battlefield tour to Ypres and the fields of Flanders. Organized and conducted by Leger Holidays and guided by Mr. Paul Reed. 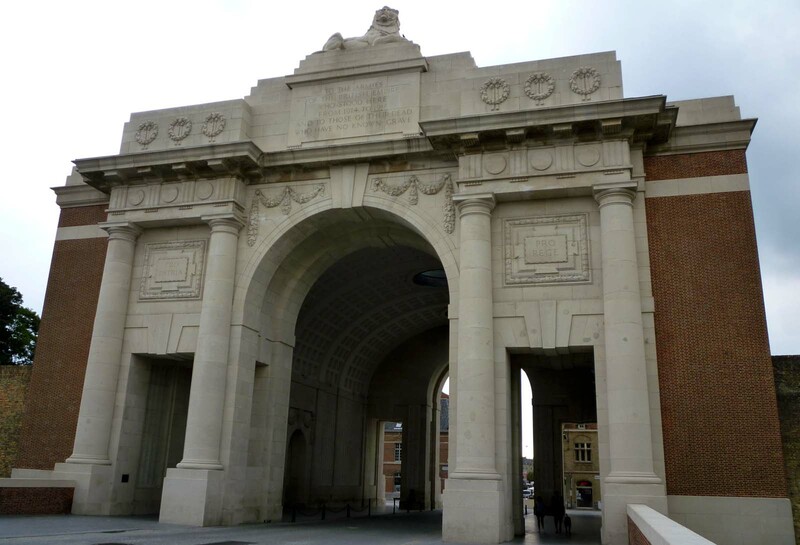 As I do not live in the UK, I travelled to Ypres by car and joined the Leger group on Friday, shortly after their bus had arrived at the hotel. All in all I count the two days that followed among the best I’ve had for ages. Certainly a most important part for a German military historian. Everything was planned and organised in a manner that would have forced an appreciative smile from even the most stiff necked Prussian staff officer. All my pre-trip questions where answered in a prompt and friendly manner by a Leger employee. 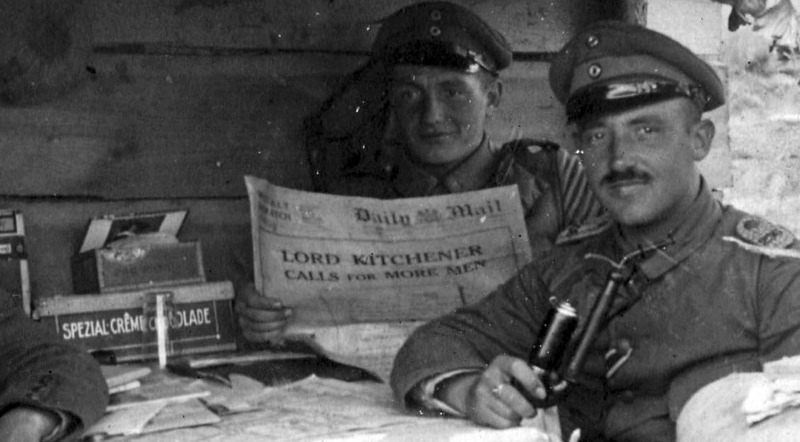 All necessary travel documents were dispatched to Germany by mail and arrived quickly afterwards. To my suprise I did not find myself in some far off hotel in the middle of nowhere, but in the “Flanders Fields” Novotel, right inside the picturesque center of Ypres. Only five minutes walk from the Flanders Fields museum, shops, bars and restaurants, I can not think of a more ideal headquarters for a Flanders battlefield tour and it was made even better by the generous size of my room, the attractive furnishing and superb breakfast including ham & eggs ‘Flemish Style’ and a wide array of breads, fruits and cereals. This alone is would be reason enough to book another Ypres tour with Leger soon. I am not small and I certainly do not fit comfortably into most run-of-the-mill buses. The bus Leger supplied did not only have plenty of room and comfortable seating, it was also clean, excellently maintained and expertly driven and crewed by Len and Alan, who were always friendly, attentive and professional. I have “known” the virtual Paul Reed for quite a while now, so the I was thrilled by the chance to finally meet him in person. He is the walking encyclopedia of the Great War I had expected him to be. An excellent tour guide, able to answer any question thrown at him. Most importantly though, it is obvious that he loves what he is doing. Paul is a professional and thus is able to present history in an understandable, entertaining and eloquent manner. I found it fascinating to see that he took the time to answer questions and give research advice even after the tours and that he always seemed to have a caring eye on the weaker and more fragile members of the group. A true gentleman. All what I have written above seems to be mirrored in the fact that many of the people in the group regularly travel with Leger. Which is what I will be doing in the future. If you want to travel the battlefields of Europe, give them a try. 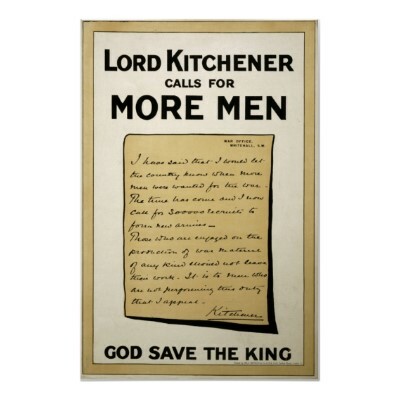 Today I received a couple of World War One photo albums. One of them contained the two photographs shown below. 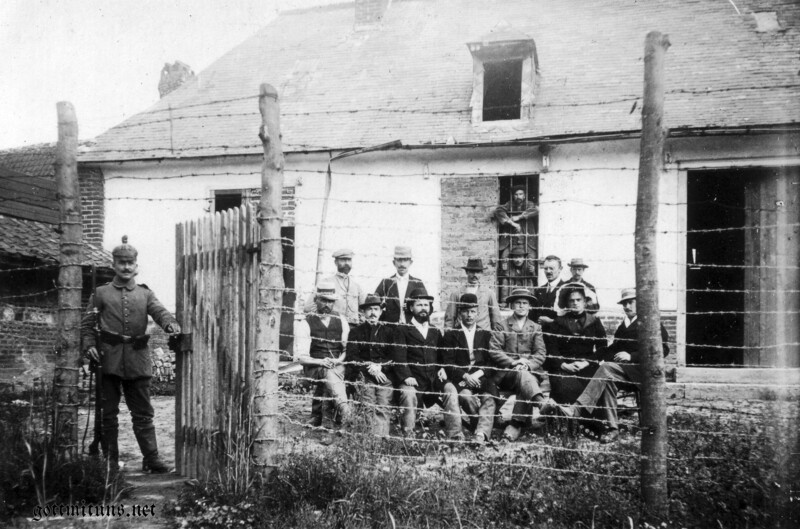 They show a group of civilian prisoners who are posing with a Prussian guard (or vice versa). The group contains a very male looking woman and first I thought that photograph must be a staged one; German soldiers having a laugh. But when you look closer the scene looks very real. 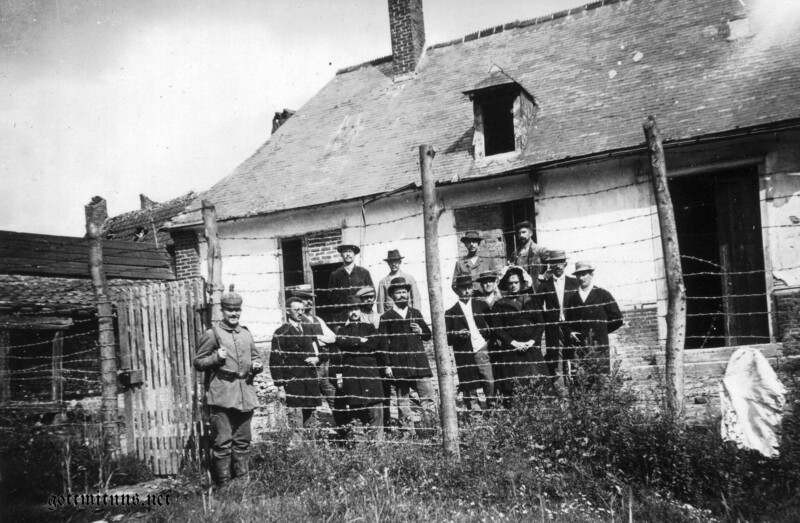 The Prussian has his bayonet fixed and the house is surrounded by a barbed wire fence and has a metal-grilled window. I don’t know where the photos were taken. They are mounted between other images taken around Ypres and Langemark Poelkapelle. A weird pair of photographs. As far as I know this title is not available anywhere else on the web. “Notes on German Shells” is a colour illustrated compendium of all shells in use by the German Army in early 1916. It was compiled from actual examples of the shells and from German pamphlets describing the use the shells were to be put to. Each shell is described in the text and with a coloured scale drawing of the shell itself. The calibres range from the 2cm and its variations through to the 42cm heavy shell. It also includes gas and shrapnel shells and mortar projectiles. The introduction is a table of all shells used with a description of their basic colour, the German name for the shell, and an index reference within the book. 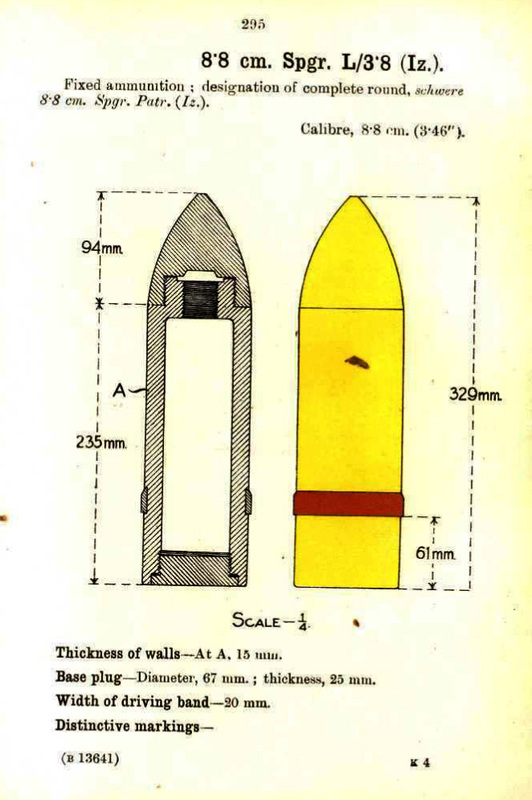 The description of the shells is extremely detailed, and includes a section on ‘Employment’ – where and when the German gunners would fire that particular shell. Next week I will upload a guide to German WW1 shell fuses! On 23 August at 4:00 a.m. a German attack by the 34. Infanterie-Division, in the 14th Division (II corps) area, from Inverness Copse to Glencorse Wood with bombers (handgrenades) and flame-thrower units, pushed the British back to the line of 22 August between Inverness Copse and Glencorse Wood. Despite a German bombardment falling short on German troops in Inverness Copse, the infantry advanced, reached the western edge, then fell back still under fire from German artillery. Another attempt in the afternoon, under a hail of fire from both artilleries, pushed the British out of the Copse to the western fringe, from the Menin road to the junction of Jargon Drive and a sunken road. 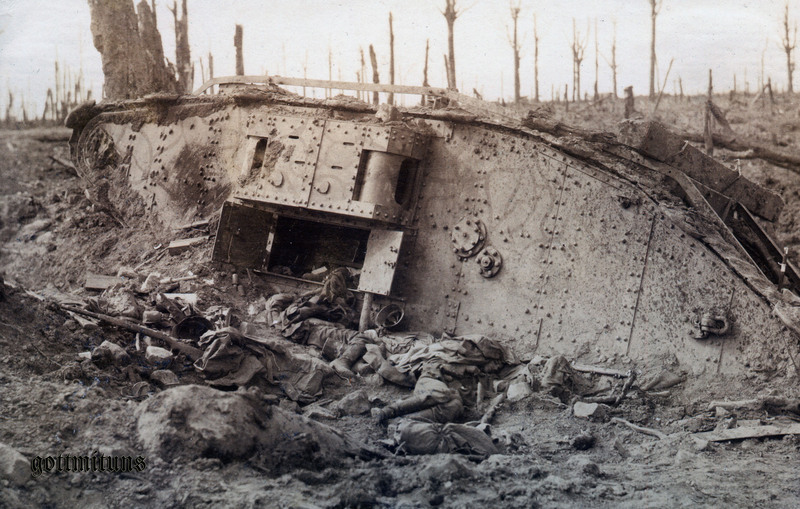 It must have been during this fighting, shortly after the Battle of Langemarck, that this tank was taken out of action. Sadly I have no details about tank losses in that area, I would love to know what happened to its crew. Details are horrible and fascinating, its intriguing that the dead soldiers lying in the mud in front of the tank seem to be german. Lots of the equipment scattered around are german aswell, a Gewehr 98, lots of Stick grenades, a steel helmet. On the right there seems to be an Enfield rifle and someone placed a German bayonet and its scabbard at the rear of the tank. One can only guess what horrible scenes took place some hours before this image was taken. According to the “Landships Forum” the tank above should be either B3 “Bystander” or B5 “Bluebird”. 2043 is missing from the summary of battle history sheets, presumably because it failed to start. 2707 is not given a crew number in the summary of battle history sheets, it has the crew number B33 in the list in the war diary (W2) , it was possibly with a different crew on this date. Tanks to advance ahead of infantry and deal with strong points in Fitzeclarence Farm and L Shaped Farm ((J.14.b.25.30). B4 broke down, (W1a) was repaired and went forward to the starting point but was then hit and burnt out (158/839). B3 started at 4.30 am (158/839) and possibly proceeded towards Fitzeclarence Farm. It must have run into the German counter attack which started at 4.30 am (s35.p60). It engaged the enemy near Inverness Copse, inflicting severe casualties on them as they retired. It then suffered a direct hit (W22)(158/839). B5 and B33 also set off at 4.30 (158/839) as the German counter attack started s35.p60). Both tanks helped drive the enemy back, with heavy loss, into Jap Trench. B5 suffered 3 Direct hits and was abandoned (W22). 2nd Lt Colley was probably wounded as he died of his wounds in August (W2). B33 rallied (W22). 2520 – no further record. 2043 – no further record, probably one of the tanks at the tank graveyard near Clapham Junction. 2707 – Fought with crew B13 at Cambrai. may have been renamed. According to “Following the Tanks” 2511 was in action at Cambrai. 4 Companies OB in ‘Following the Tanks, Cambrai’ is based on the list in the War diary which is incorrectly dated to Cambrai. “Black Prince”, 2005 was hit and burnt out at Messines on 7th June 1917 the list must therefore have been written prior to this date. 5 Companies OB is accurate for the 20th November according to the notes. A “Bushranger II” is listed with crew B37; presumably “Bushranger” did not therefore survive 3rd Ypres in operable condition. W2a – War Diary No2 / B Battalion Tank Corps / B Coy HBMGC 1916 – 1919 Appendices. S37 – Jean-Luc Gibot and Phillippe Gorczynski (1999) Following the Tanks, Cambrai. OOB excerpt. Just a quick photo while I have the time. Just preparing the next set of photos taken by a member of I.R.236 (see last post) when I saw this. Amusing, so it needs to be shared 🙂 Enjoy. 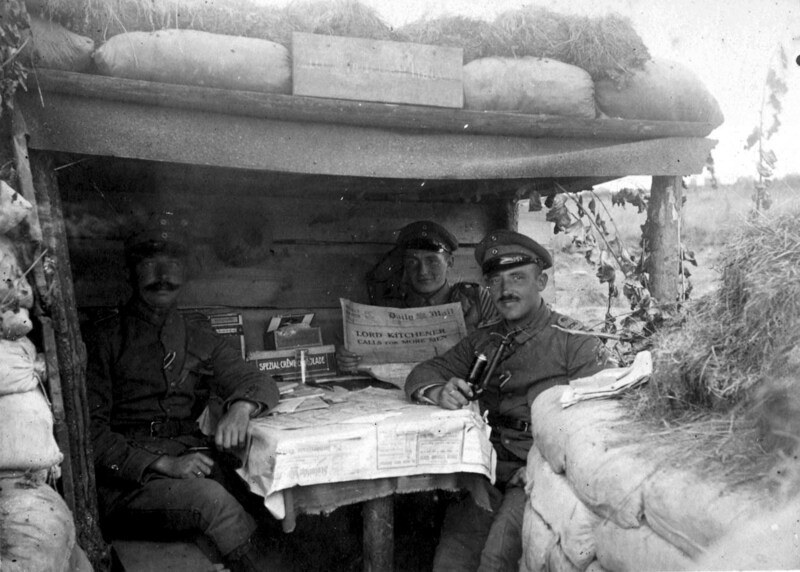 In a german trench, 236th Regiment of Infantry (I.R.236) near Wieltje (Ypres) 1915. Why I chose the title of “Dragons” over the Western Front will become clear when you have finished reading the article.. Balloons had been in use by the military since the wars of the coalition (1792-1815). In Prussia Balloon troops were became part of the regular army on the 9th of May 1884. In February 1915 there were only 9 Balloons on the whole Western Front. Balloon troops (Feldluftschiffer) with their cumbersome and heavy equipment were thought to be quite useless in modern, mobile warfare and there were even tries to abolish this arm completely, but after the Battle of the Marne in September 1914 the front froze to a standstill. In Spring 1915 Major Hermann Thomsen, and old and experienced balloonist, wrote an exposé on the “Condition of the field aeronautical service” (“Denkschrift zur Lage der Feldluftschifferei”) which was very well within military circles and by the Kaiser himself. It was due to this that on the 11th of March 1915, by highest order of the cabinet (Allerhöchste Kabinettsorder / AKO), a new army department known as “Chef des Feldflugwesens” (Chief of Field Air Forces) was founded to which all Air Force units, planes, airships, balloons and also the meteorological services were subordinated. On the 21st of February 1916 the german army opened its attack on Verdun and the fortresses in front of it. For the first time 12 balloons were used together. 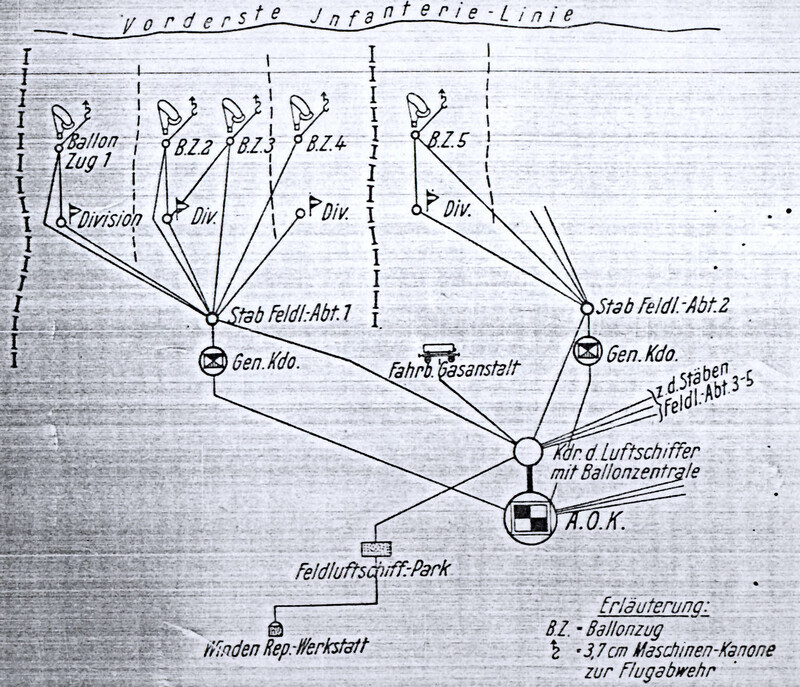 AOK 5 built special lines of communications for the balloon units leading to a central “Ballonzentrale” (Ballooncentral) which utilized all incoming reconnaissance reports of the attached balloon units before passing them on to High Command. As every Balloon Platoon only had a single balloon the whole unit was wiped out when the balloon was shot down or damaged. Only after receiving a new one the unit was ready to get into action again. Due to this “Feldluftschiffer-Depots” were set up behind the front which stocked spare balloons and parts to be able to replenish losses fast and efficiently. It was also during the Battle of Verdun where the german Balloon troops suffered the first severe losses when the enemy introduced incendiary ammunition (one of the first victims of this new type of ammo was the airship LZ77 which was shot down on the 21st of February 1916). During the Battle of the Somme (24th of June to 26th of November 1916) more than half of the total available FLAs Feldluftschifferabteilungen (Balloon units) were committed. Altogether 18 FLAs with a total of 50 Balloons. For the first time in the war each Army command (A.O.K.) had its own “Ballonzentrale” and for the first time the balloonists received the urgently needed cover by fighter planes as the enemy had finally recognised Balloons and their work as dangerous and important. The year 1916 had firmly established the new german Luftwaffe and duly appropriated its use and tasks. The enemy aswell has the german army had recognised was Balloons and airships were able to do. On the 8th of October 1916 the german army had 53 FLA (Feldluftschifferabteilungen) with 128 Ballonzügen (Balloon platoons) and 7 Ballonzentralen (Balloon Centrals). FLAs and Balloonzüge were further divided into reconnaissance and combatgroups resulting in a massive rise of their effectiveness. When the use of german airships (Zeppelins) declined in Spring 1917, most of the now available ground personell was transfered to balloon units. 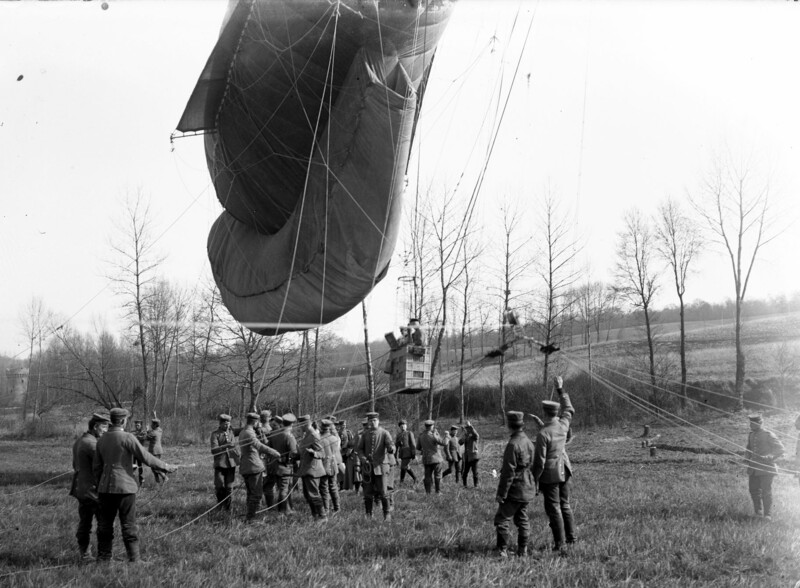 In Summer 1918 the army had 186 Ballonzüge (with 2 Balloons each). During their peak of their effectiveness the Feldluftschiffer units had to pay the ultimate price for it. Losses were brutal. As soon as a balloon was spotted it was fired upon by the enemy. 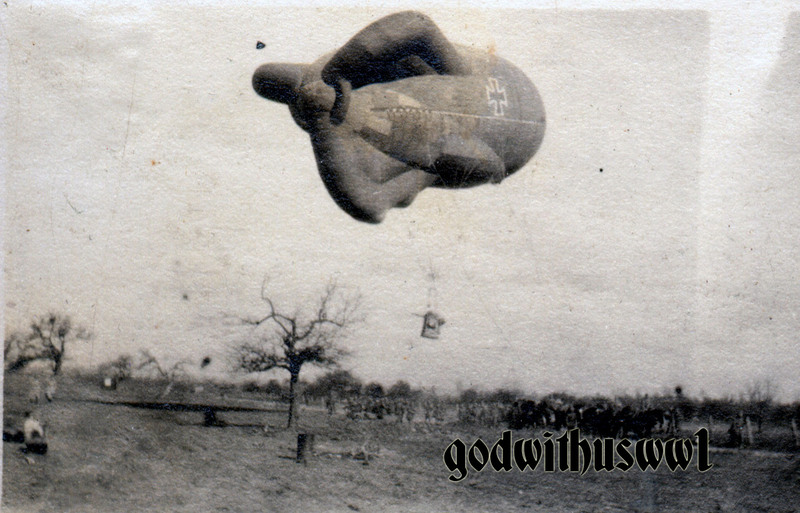 The german Balloon service had risen from a unregarded arm to a much-noticed effective fighting force. Without them tactical close reconnaissance had become impossible. World War I observation crews, were the first to use parachutes on a wide scale, long before they were adopted by fixed wing aircraft. These were a primitive parachute type where the main part was in a bag suspended from the balloon with the pilot only wearing a simple body harness around his waist which lines from the harness attached to the main parachute in the bag. When the balloon crew jumped the main part of the parachute was pulled from the bag, with the shroud lines first, followed by the main canopy. 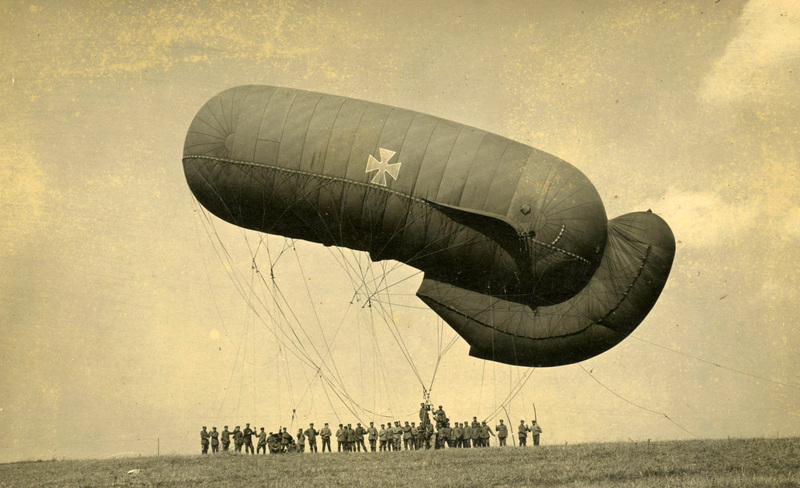 This type of parachute was first adopted on a large-scale by the Germans, and then later by the British and French for their observation balloon crews. 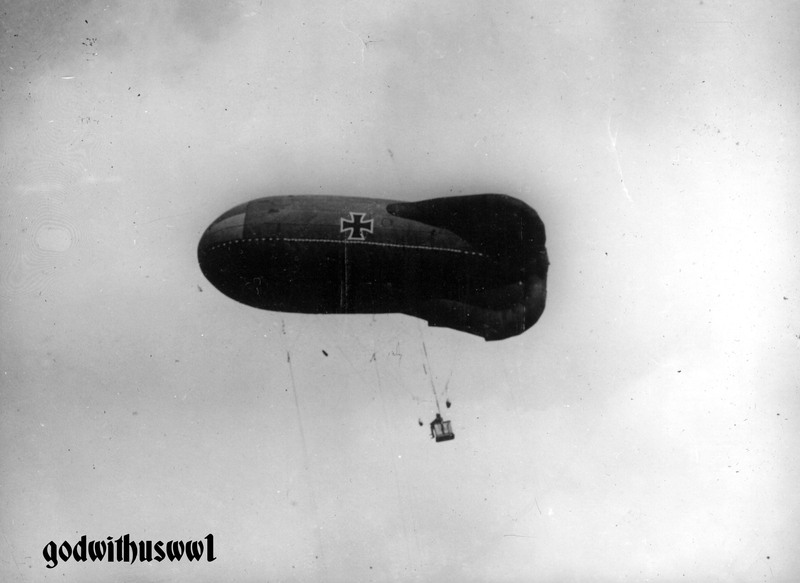 The Germans made excellent use of observation balloons in several configurations. An early variety made by Parseval-Sigsfeldand called “Drachen” (Dragon), had a single fin, low centre, and was totally cylindrical, with rounded ends. The British called them sausages, for obvious reasons. The balloon’s shape gave it another nickname, “Nülle” or “Testicle”. The Caquot was tear-drop shaped, with three stabilizing fins. The Germans used a copy of a French Caquot, the designation was “Type Ae 800” for Achthundert (800) which was a reference to the cubic meter capacity English, the reason for this being the design was stolen from a captured British balloon design. The improved Caquot could ride higher, and fly in higher winds than the Parseval-Sigsfeld, so it quickly replaced the Drachen, even among the Luftschiffertruppen. The observer suspended in the wicker basket typically had a wireless set, binoculars and one or two long-range, cameras with him. Their job was to observe actions on the front and behind it, to spot enemy troop movements, unusual activity of any sort, and to call down artillery fire onto any worthy targets. 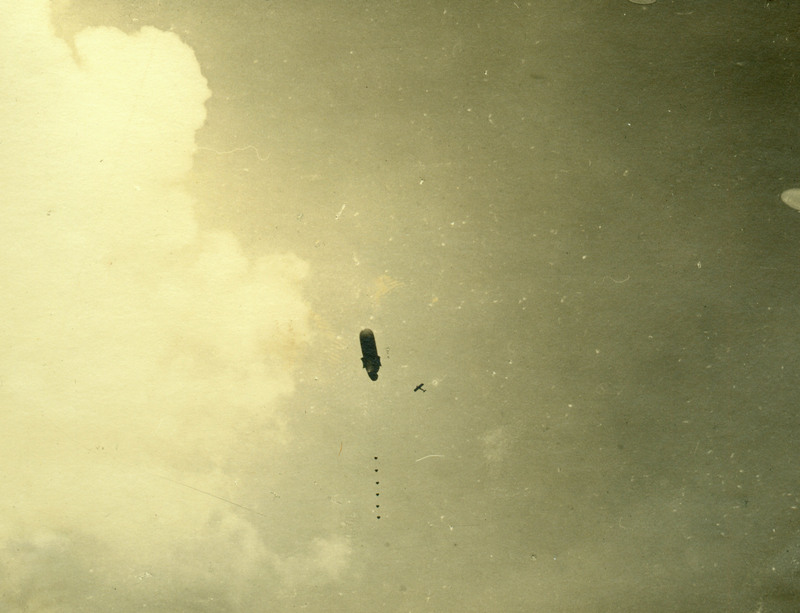 They were targets of great importance to the British HQ, especially before any sort of infantry action, so squadrons were frequently ordered to target balloons. This was especially risky as they were well guarded with AA guns, long-range machine guns and a fighter Screen. Getting to the balloon was easy, shooting it up was difficult and getting away was very difficult. It required good nerves, quick reactions, and an all round good pilot to fight their way through the defences, hit the balloon before it is pulled down and then get away again. It was a rule of thumb with British pilots to never go after balloons below 1,000 feet, the AA and mg fire was too dangerous. The balloons could be pulled down very quickly as they were tethered to a motorized winch, so that once a fighter was spotted the balloon could be down in under a minute. 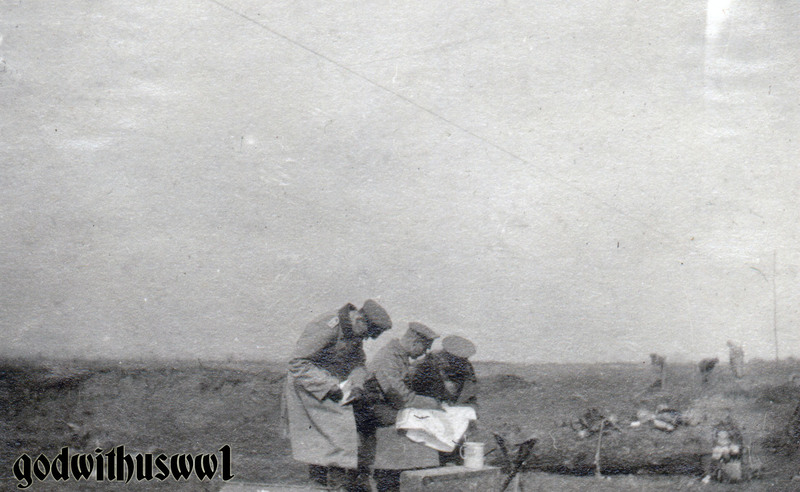 By the war’s end 241 German observation balloons had been shot down. As a sidenote, one of the last german WW1 veterans to pass away (in 2004), Arno Wagner, was a radio operator and artillery spotter serving a Feldluftschiffer unit.